The Forbidden City and China have been intertwined for 600 years. When Emperor Yongle built it from 1407 to 1420, both palace and country embarked on a relationship that has been glorious and tragic at different times. It’s still at China’s political center. We’ll explore more of its history in this post and the next. 1. Yongle’s Ming dynasty prospered at first. Commerce and oceanic exploration grew, and painting, ceramics and literature flourished. But several crises converged in the late 16th century. Wars with the Mongols and Japan combined with the court’s lavish expenditures to stress the state’s finances. The government taxed the peasants more harshly. Many left their lands for the mountains and formed armed bands. The court was too engrossed in its rituals, and torn between factions of Confucian officials and eunuchs to solve domestic problems. It was thus unable to hold off the invading Manchus, who founded the Qing dynasty in 1644. This would be China’s last imperial dynasty. 2. The Manchus originated in southern Siberia, from Tungusic roots. They and the Chinese considered themselves very distinct from each other. When the Manchus founded the Qing Dynasty, they made both groups live in separate sections of Beijing–the Manchus lived in the northern part, which was the most splendid. Beihai park still presides there. Mixed marriages were forbidden, and everyone was forced to wear a plait. 3. The great Emperor Kangxi reigned from 1662 to 1722, and he integrated both groups. He was a model benevolent despot. He protected the peasants from land confiscations and encouraged agricultural development by moderating taxes on farmers. 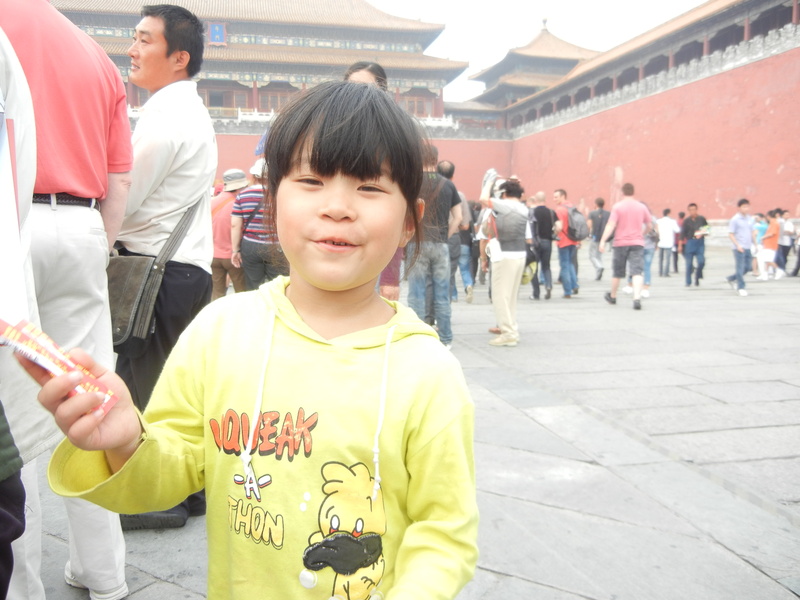 China’s population would increase to unprecedented levels. Kangxi also spearheaded a huge compilation of classical literature. He also patronized Tibetan Buddhism. Under Kangxi, China was on its way to new levels of wealth, and its boundaries would grow to twice the size of the Ming Dynasty’s. Yongle’s dream was coming true–his palace presided in the center of the Middle Kingdom as it was growing to new heights. 4. You enter the Forbidden City from the south, and pass through several gates. 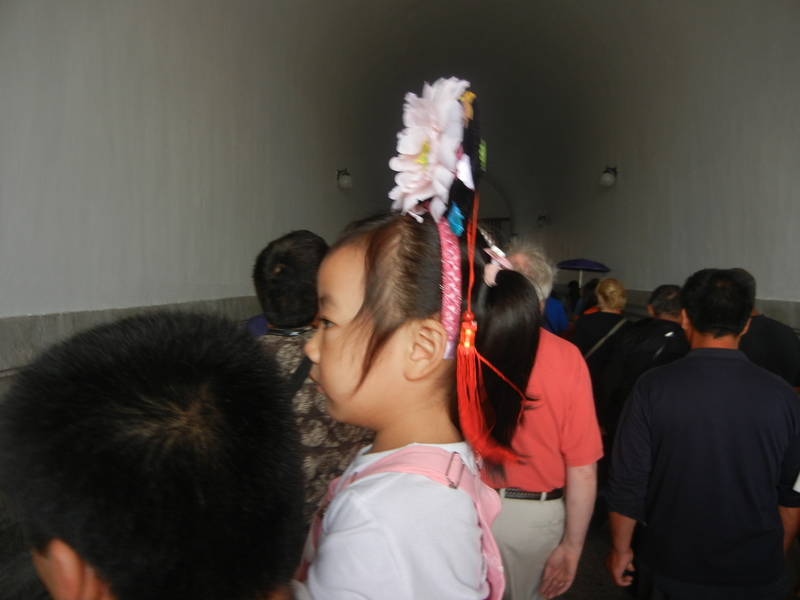 After the Meridian Gate, you go through the Gate of Supreme Harmony. Then you behold the Hall of Supreme Harmony (pictured above). This was China’s political center. 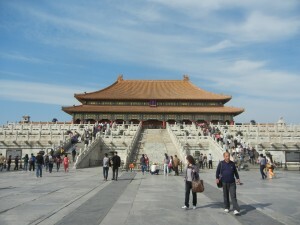 It was the largest structure in the Forbidden City, and the most important ceremonies were held here. The emperor conducted rites for the new year and Winter Solstice. He also celebrated his enthronement, weddings, birthdays, and the appointment of generals here. Musicians with golden bells provided regal sounds to match the building’s splendor. Anyone at these ceremonies must have thought that the state had the power to harmonize the universe. But Qing society was becoming complex in ways its emperors probably didn’t imagine. We’ll see how in the next post.